One of the earliest photographs ever made is of a busy Parisian boulevard. 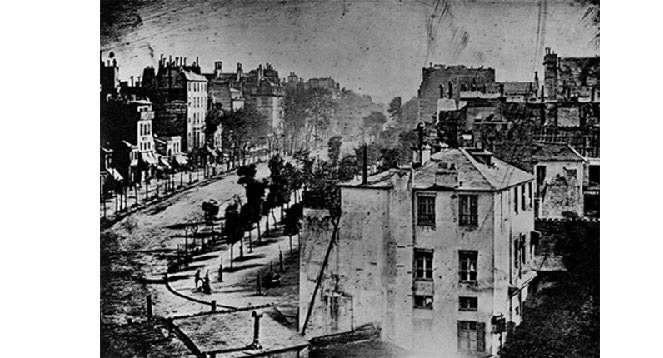 As well as being one of the first non-studio images by the photographer Daguerre, it is also fascinating as it evocatively illustrates how photography can ‘see’ in a new way, as in fact the activity in the street is made invisible due to the length of time required to make the exposure, except famously for a single man standing to have his shoes shined for the duration of the exposure. Taking this photograph as a starting point, “A Description of the World: After Daguerre” substitutes another common thoroughfare and explores ways of recording and documenting the activity within it. I think of “A Description of the World: After Daguerre” as a documentary. It records a series of events with surveillance like objectivity. In its form of presentation it juggles with the problems created by attempting to offer the viewer a comprehensive record of activities occurring in four different spaces in real time. Some viewers have described the film as a ‘soap-opera’, as the viewer travels the intertwining narratives of different characters. A Description of the World - After Daguerre presents us with an impassive, functional image of a lift in an institutional building – probably a university or college – of some kind. Roger Hewins’ film is ostensibly a study of the passage of time, but perhaps more importantly a study in watching and being watched – and of the creeping homogeneity which makes possible the remarkable spatio-temporal superimposition the work describes. At first ordered, reticent, even graceful, the work reads like an opera for lifts.